You’d be forgiven that I might have been taking it easy after finishing up my Rivendell and Angmar armies for the Middle-earth Strategy Battle Game… I have not. As is my usual modus operandi when it comes to army building, my priority one is normally to build a functioning army1 out from an initial concept centred around the Rule of Cool, Minimal Repetition and Speed of Execution (in that order) and get some games under my belt before I start making some changes and improvements. In the case of my Rivendell army, I wanted to do 8 of each basic Warrior model I had available (two handed sword, bow, and spear/shield), along with a box of Rivendell Knights and some of the most obvious heroes that I could find models for. 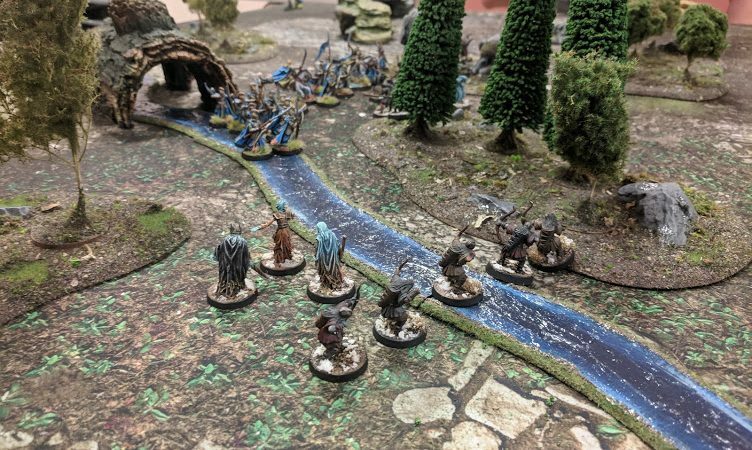 I achieved this basic goal, and moved onto Angmar – an army that really wanted at least a Shade, some Barrow-Wights and Spectres to truly feel like an Angmar force, along with a buttload of Orcs, Trolls and a Ringwraith to really round things out. 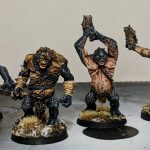 There’s some awesome, impressive models that I’d like to add to the list – a Fell-Beast is one, and Gûlavhar another – but I decided to leave those out in Wave #1 while I got my head around the army itself. After finishing these, it was time for Wave #2. Spears and Shields individually don’t break the points bank at 1 point each a piece, but using one kind of nullifies the point of the other. My Rivendell Knights all have shields, meaning I have no suitable WYSIWYG models for dismounts. And thus the first glaring hole in my collection became apparent – I really needed some Elf Warriors with Elven Blade and Shield; these would serve as both a front-line for my army (and thus not wasting any unnecessary points on spears), as well as more suitable dismount miniatures for my Rivendell Knights. M original plans for these minis were somewhat unambitious. I had planned to take my swordsmen miniatures and simply glue a bunch of shields from High Elf Spearmen on their backs and call it a day. However, after dry fitting the pieces a few times, I just couldn’t find a way that didn’t look like an utter cop out. Aside from that, the swordsmen all had a very specific pose of which there was only two minor variants, which was unexciting to say the least. After examining my other option however – the High Elf Spearmen themselves, it became clear that they were a more suitable miniature to base the conversion on – as well as having a little more variety in poses, which was a nice added bonus. The Swordsmen were a fairly simple kitbash – I took my finecast Elf Spearmen and picked out twelve with the least instrusive looking spear shafts – this is, the ones with minimum moulded contact with the armour. The simplest part was snipping the spears from just above their hands and replacing it with a hand and a half sword from a plastic mini. This had a different aesthetic alrogether from the spear but still largely worked well with the spearmen poses, in my opinion – ranging from an aloof, sword held parallel to the swordsman’s face to guarded raised shields or swiping or stabbing motions. The next, more difficult part of the conversion was cutting down the spear shaft beneath the hand, to create a believably long hand and a half hilt without looking too.. speary. Annoyingly, the spears were somewhat moulded onto the bodies of the spearmen, and so this required both snipping of the spear as well as careful cutting and in some cases sculpting of lost details back onto the model. Some turned out better than others, but I’m very happy with the overall look of the conversion after the shield was affixed and the model painted and sealed. Beyond the innumerable gameplay benefits of these miniatures, I do think the army really benefits aesthetically from the inclusion of these conversions. While the Spearmen models aren’t perfect – the helmet visor being a bit too narrow makes it incredibly difficult to do anything beyond a base coat and wash on the faces – they really do look more dynamic and interesting than a sea of swordsmen with their arms above their head, and also have a little more detail per miniature on their helmet designs and the like. The next batch of work that I did to my warriors was simply an increase in numbers. I’m not wholely sure that I really needed 500-odd points worth of foot slogging warriors (if you count the banner), but I already had the miniatures2 and it felt daft not to paint them up and give myself the option. I had built 12 sword and shield warriors to give myself a little excess to use as dismounts for my Rivendell Knights, and I felt like I should at least expand out my Bowmen and Spearmen to that same 12 man full-warband, which used up just about all of my miniatures I had left and in tact. Fortunately, I’d used up all my plastic Elven Blade miniatures for the conversions, so didn’t feel that same pull to paint another 4 of them. The second addition that I made to my warriors came as something of a byproduct to the creation of my sword and shield warriors. Perhaps inspired by some of the Morannan Orc spearmen holding their spears overhead, I had considered using my leftover spears from my sword and shield conversions on my now weaponless plastic Elven Blade minis. The conversion would be just as simple, and it would afford me more more cheaper back rank spearmen – less flexible than their sword and shield buddies, but just as good in a supporting role. This was novel, but in the end I decided that it would be perhaps better to give to my bowmen and make them a little more useful in a support role when things get a bit heated. It didn’t hurt that doing this meant I wouldn’t need to paint any more warriors at this point either. I reconstructed the spears by cutting the blade portion from the remainder of the shaft and gluing it to some plastic spears that I found on eBay, possibly from some Warlord Games historical miniatures and cut the shaft to the appropriate length. After a quick paint job, they affixed nicely next to the bowmens’ quiver and I patted myself on the back for a job well done. Somewhere along the line, I also decided to give my bowmen some bowstrings (credit to my long suffering partner for that suggestion). Based on some suggestions I found from Googling the issue, I settled on 0.5mm nylon string, affixed with super glue (an awkward process to be sure, and one I wouldn’t tecpmreco without CA glue accelerator spray and the occasional assistance from acsecond pair of hands) and then tinted with a couple thin layers of Seraphim Sepia and Lamenters Yellow wash. I’m really happy with the effect, and it adds a little extra flair to some otherwise fairly static sculpts. I liken the process to drilling your boltgun barrels in 40K – a slightly awkward and fiddley step that fixes a minor, but rather jarring issue with the miniatures that’s hard not to notice once you’ve done it for the first time. 12 High Elf Warriors with Spear and Elf Bow.. new additions being the extra five, along with bowstrings and spears for the lot of them… This army looks very blue from the back. With my Warriors finished, I was free to indulge in some Hero models that my army was missing. First on the table was Glorfindel, Lord of the West. At the time, I wasn’t able to source an armoured one for love for money, but another issue was that there wasn’t such a thing as an armoured Glorfindel on horseback. 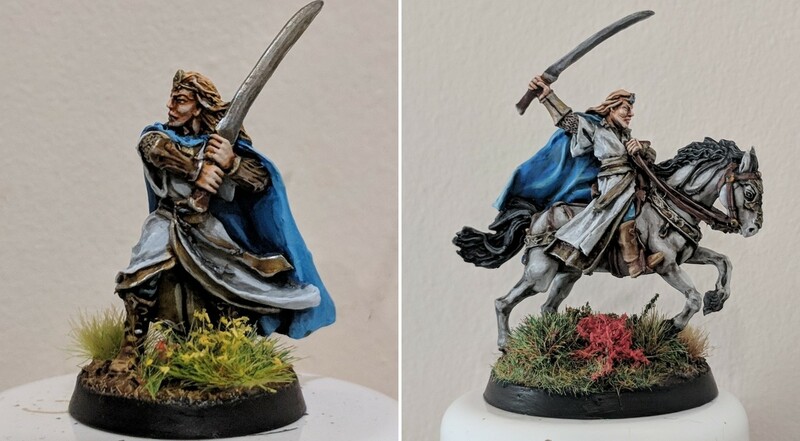 That complicated things enough to put me off entirely, and rather than butchering another mounted hero with a sawn off Glorfindel, I opted to paint the robed version. Colour wise, I settled on white. I like the idea of my various characters having different coloured garments, but tied together by the armour and the magic blue cloaks. 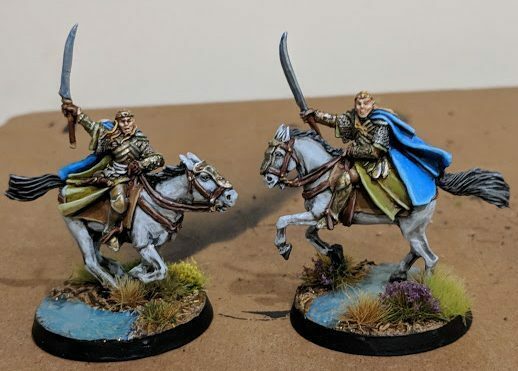 For Arwen and Elrond, I had a movie to reference and painted them accordingly – Arwen a dark turquoise, whils I matched my mounted Elrond to the Last Alliance one. For Elladan and Elrohir, I also gave them green robes to match their dad. For Glorfindel, he deserved something unique, and I went for crisp white robes with a golden sash – somewhat lordly, and gracefully clean. His base was a slight departure from my usual water effects bases on the cavalry in this army, though not for any particular reason.. I just forgot when I was texturing it. To make up for the boring base, I plastered it with thick foliage and it sort of looks like it’s own thing now – the bushy wilds of the Trollshaws, perhaps on his way to rescue Frodo following the incident at Weathertop? Speaking of mounted heroes, by this point I figured it was high time Elladan and Elrohir got mounts of their own. Since both minis have come back in stock in their armoured form with mounts, I picked up the pair and set about painting the twins for the second and third time. I decided to stay with the same scheme as their robed models, and carry on my theme of white horses for Elves. 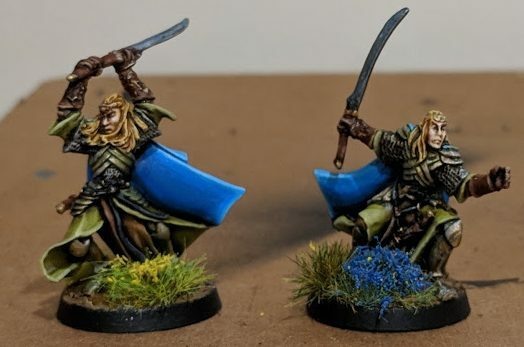 Slightly resent myself for painting their unarmoured models and creating extra work for myself, but more options is never really a bad thing – and they fit thematically with unarmoured Glorfindel above. Although I’m not overly fond of the weird squatting pose of armoured Elrohir on foot, the sculpt is objectively better than the original and fits in with the rest of the army a lot nicer without those comically disproportionate swords. To finish the army off on a nice and easy note (and nothing to do with how long they took to ship from the seller in Poland), I was lucky enough to get a halfway reasonable deal on Cirdan and Erestor3. Erestor was pretty by the books, while I continued my theme of giving my robed Elves a unique robe under a unified cloak – this time a warm creamy off white with a reddish purple sash. I never say never to adding to an army, but I think that’s my Elves largely done with for now. Keen-eyed readers will pick up that I’m missing a Stormcaller, Lindir and Gildor from the collection, which I’ll add if they ever come back into production at GW – but certainly not at the prices asked for Lindir especially on eBay right now. 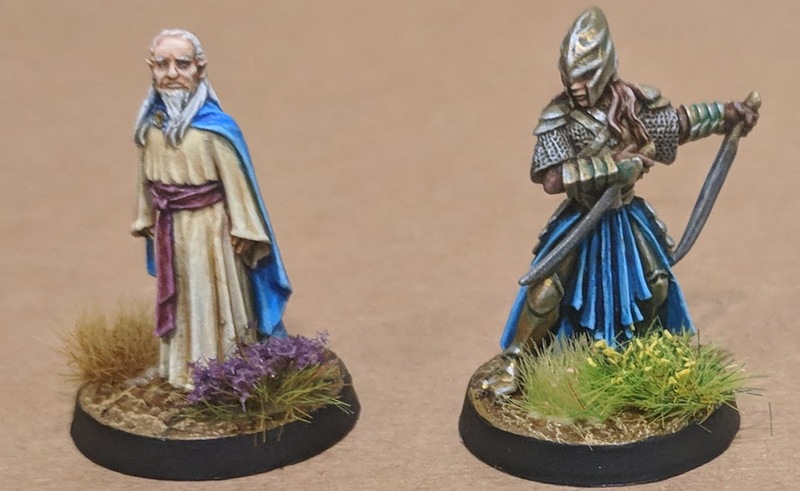 I’d also rather like to go back and paint my Hobbit-era Elrond on foot to match his mounted counterpart better, as well as my Arwen on horseback4, though neither are particularly essential to me at this moment. The only other thing that niggles at me is that I really love the armoured Glorfindel on foot miniature, who would perhaps fit better aesthetically with all my other armoured Elven heroes, and I might pick up another box of Rivendell Knights and a couple of Glorfindels to convert up a foot and mounted pair, along with maybe a Knight with a Banner. This is the point where I’d normally wrap up and say thanks for reading, but I’ve been particularly busy this month, and I’ve actually got a couple of other things to show for Middle-earth. In between building a themed terrain set from model railway and aquarium scenics and playing my first couple of games, I’d also managed to knock out a few more bits and pieces for funsies. The first of which is a certain mysterious character whom Erestor had once considered as a potential guardian of the ring and his lovely wife.. I can’t quite tell you why I bought this pair of miniatures. Perhaps, having already having the Barrow Wights for my Angmar army, I thought this might make for a fun couple of miniatures for narrative and scenario play. Or perhaps I just loved the idea that this pair even had miniatures and wanted to paint them for the hell of it. 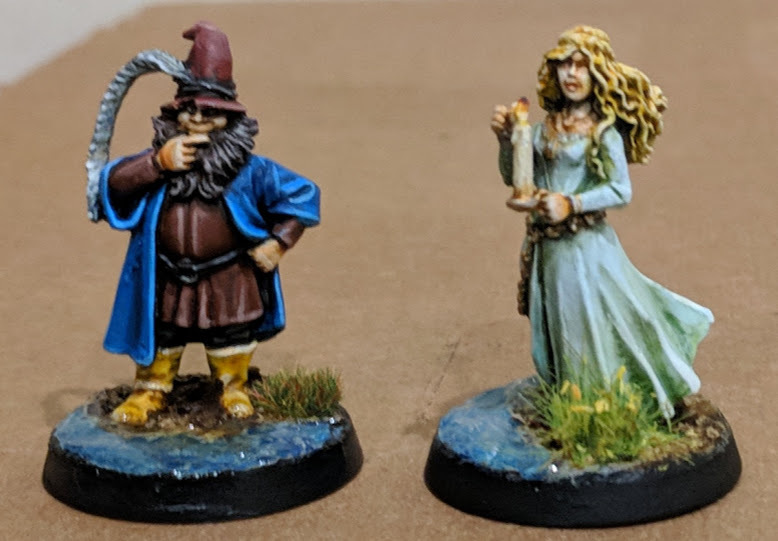 Either way, they were a fun little palette cleanser that kept me busy between projects, and I especially enjoyed painting Goldberry’s faintly river-green white dress, and learned a few things about painting these sort of garments in the process. I can’t tell you what possessed me to go out and get these miniatures, but I’m extremely glad I did. Although the Middle-earth project has largely came out of me wanting to paint an Elf army, I’m an absolutely massive fan of the Nazgul of the Tolkiens Legendarium, and utterly adore the concept and aesthetics of them from their Black Rider forms to more armoured forms such as the Witch King at Minas Tirith and the Nazgul of Dol Guldur. Having largely spent my Middle-earth painting efforts on miniatures from the original LOTR SBG incarnation of the game, I found myself more and more wanting to get me some of ForgeWorlds incredibly impressive modern sculpts from The Hobbit era of the game, and these were front and centre the most exciting to me. The paint jobs were actually immensely simple, and it’s very easy to get some great looking miniatures out of these, as the sculpts themselves do most of the work for you. The Nazgul all in all took me just over an evening to paint, and were a simple case of prime black, paint metals silver, wash with Agrax Earthshade, drybrush cloth material grey, and then I washed the whole thing again with Nuln Oil. Once dry, I then drybrushed the metals silver again and the robes lightly with the same colour of grey again – the pre-shade now being darkened from the first drybrush giving it a little depth and texture with minimal effort. I drybrushed once more very lightly with a lighter shade of grey before carefully edge highlighting the extremities with a lighter yet grey. At this point, the miniatures are finished – it’s that easy. The Necromancer had a very similar approach to painting him, only with Vallejo Hawk Turquoise washed down with Drakenhof Nightshade and worked up again with Vallejo Jade Green. Starting from black and giving him kind of messy and thick highlights, washing with blacks and blues and working up again in a few successive layers gives the highlights an effect that looks very similar to blending, but requires a lot less concentration of effort at every step. Finally, he gets a couple successively lighter and concentrated edge highlights to really make him pop, and I painted his Eye clasp in a fiery blend of red to yellow for just a little bit of menacing colour contrast. Despite being objectively the worst model of the set (the sculpt being pre-Hobbit and thus not quite matching the realistic aesthetics of the Nazgul), I’m overall really happy with how spooky and menacing he’s turned out and think he really pops among his dark disciples. One last thing I wanted to mention was the bases. These being such sensational sculpts, with each miniature a character in their own right, I really wanted the army to do something a little different and a little special compared to my other two armies – although you’re extremely limited with what you can do on a 25mm base, I will admit. In the end, I decided to make their bases look like the dark spooky gloom of Dol Guldur itself. As I magnetise my models for transport, I really didn’t want to use resin bases as these are a massive faff if you want to stick a magnet under them, do I ordered myself a texture roller from Green Stuff World – the idea being that you spread some green stuff or milliput on the bases and roll over the pin, which leaves an impression of some texture in your base. Pretty good for a tenner, and after studying the Battle of Five Armies again to try and gauge what the floors of Dol Guldur looked like, I settled for the Flagstone roller – not the most exciting design, but probably the best suited for this project. After pressing them, I superglued a little sand for grit in a few places and stuck my Nazgul down to them with superglue. 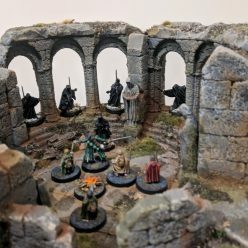 These were incredibly quick to paint, and I did my usual technique of painting flagstones by painting the stones each one of a few different shades of grey, followed by a unifying wash and drybrush. In this case, I washed them with Drakenhof Nightshade and Biel Tan Green before drybrushing a 50:50 mix of Vallejo Khaki and Camoflague Green. Phew! That’s it, finally. All my Middle-earth hobby over the past month, and just about all that I have on my table at the moment. I’m going to try and avoid acquiring any new miniatures over December and deal with some of the items on my backlog. Fortunately for me, the most abundant minis I have in ‘to do’ state is my Iron Warriors project that I put on hold much earlier in the year which, after an initial burst of excitement, had tapered off a bit while I got my teeth into many, many more Space Wolves – following a rather excellent recent Heresy event however, I’m finding myself much more motivated to go back and paint power armour again. I’ve already worked myself up enough to finishing painting Perturabo, followed by 10 Cataphractii Terminators, and with only a Typhon, 2 Medusa, 10 Iron Havocs and a couple of characters to go, it’s looking possible that I might just actually finish this project by the end of the year. Wish me luck. 3 Of course, Erestor is now back in production at Games Workshop for a pretty reasonable price. Still, his additional cost was somewhat offset by the very reasonable asking price I paid for Cirdan, who remains OOP at the time of posting this. 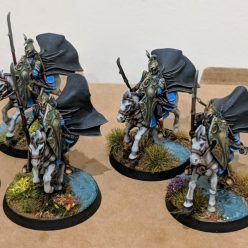 4 Arwen on horseback is one I’m saving for when I get enough mounted/named Ringwraiths for my Angmar army that I can recreate the Nazgul chase over the Bruinen on my Trollshaws board. It could be fun to do it with both Arwen and Glorfindel and see who did it better. 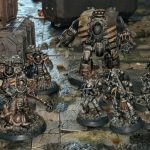 Sensational conversions and your painting skills are outstanding. Thanks for posting. Thank you very much for the kind words, I really appreciate your comment!